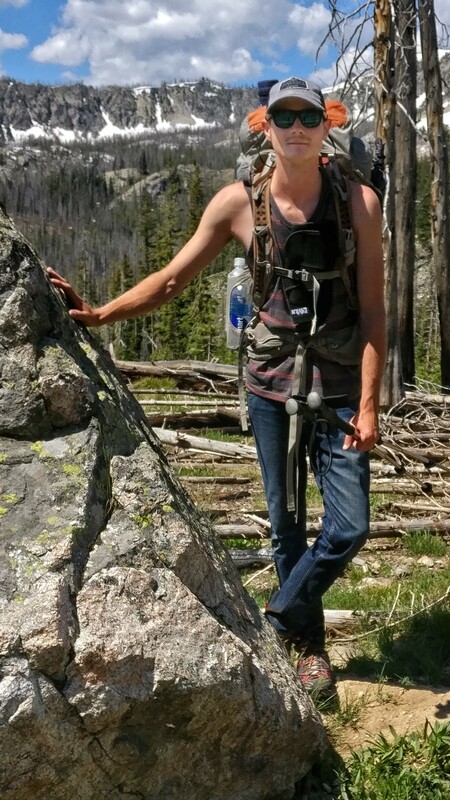 I am happy to say that I finally have a full backpacking-trip report for your enjoyment. The weather cooperated and allowed me to get out on this holiday weekend. No fireworks for me though; just the sparks from a campfire in a place I consider to be paradise. This weekend’s excursion took me to Two Mouth Lakes in Idaho’s Selkirk Mountains, one of my top five favorite campsites from last summer! The trail to Two Mouth Lakes climbs about 1800 feet over the course of 4 miles. For the first 3/4 mile, the trail follows an old road that is hot/dry and overgrown with alder. It climbs steadily through forests of western hemlock, subalpine fir, and Englemann spruce. There is even a section with some of the largest western white pines I have ever seen, with one roughly 4 1/2 to 5 feet in diameter. Being that there is still a substantial amount of snow in the highest reaches and temperatures are hot, there was seasonal runoff everywhere. After about the first mile, water covered much of the trail whether it was flowing like a stream or just overly swampy/muddy. Even through the sections with wooden walkways, water flowed up and over with no place to go. Fortunately, I wore a pair of Gore-Tex shoes and my feet stayed dry as I sloshed right through. As the trail neared the pass at the 3 1/3 mile mark, I hit heavy snow. The higher elevation area still contained patches 2 to 4 feet deep. However the trees began to thin out making navigation much easier, just slow-going as I kicked in steps uphill. 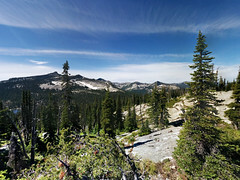 Once on top of the pass, views of the surrounding area really opened up, including a fantastic view of Harrison Peak. From there, the trail descended gently towards the two lakes. Two Mouth Lakes sit in a large, marshy basin at around 5800 feet. The two very pretty lakes are surrounded by subalpine fir, Englemann spruce, and even some whitebark pines. The trees here tend to be stunted and twisted from the high elevation/wet conditions and are well spaced making the basin feel more open and viewable. Giant boulders are intermingled with grassy areas, dotted by marshy pools and flowing-water lined with huckleberries, round-leaf violets, and glacier lilies. If I were a moose, this would my home. This area is designated official grizzly bear habitat but unfortunately I did not see one or any wildlife for that matter. Small patches of snow were scattered throughout the basin, but not so much as to prevent me from finding a dry spot to pitch my tent. There was no one at either of the lakes when I >arrived and that night I enjoyed the the lower one all to myself. Friday morning I awoke to the sun peeking over the trees, announcing that the weather for the day would be clear. I had packed enough food for two nights and decided to leave my camp and explore the surrounding area. First, I made the short 1/2 mile trek to the upper lake which is larger than the lower, but not as scenic in my opinion. It lacks the quaint-grassy feel of the smaller more marshy lower lake where I prefer to camp. At the base of the peaks to the south of Two Mouth Lakes, there sit two more lakes known on my map simply as lake 6291′ and lake 6321′. Neither one of these name-less lakes has a trail to it and I decided it be worth the trouble to bushwhack up to these rarely-seen gems. The trek to these lakes includes a climb of about 600 feet over 1 1/2 miles. The majority of the climb was on the north aspect of a hill and therefore was almost entirely over snow. The snow actually made the hiking easier as it kept me elevated above the brush and provide good solid footholds. I wore my crampons and used my trekking poles which made the trip much easier. 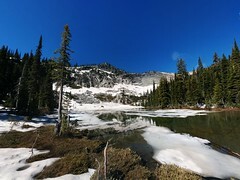 The lower lake sits in a granite cirque below a name-less peak and the snow-surrounded water was still mostly frozen. The larger upper lake, which sits in the cirque at the base of Harrison Peak was almost completely thawed out. Harrison Peak is a very recognizable feature in the southern Selkirks and I hope to summit it eventually from the other side. Even with the snow, the trip to see these remote lakes was well worth it. That evening, a number of other hikers arrived at the lower Two Mouth Lake. Although it was no longer my own “private” lake, they were courteous and quiet and I still had a very enjoyable 4th of July as I watched the sunset. It may sound dumb and cliche, but to me personally, wilderness is what America is all about. These places offer freedom from the problems of the modern world and a chance to live more simply, if only temporarily. I hope that future generations will understand that the land is one of the factors that makes this country great and we must leave some of it wild.